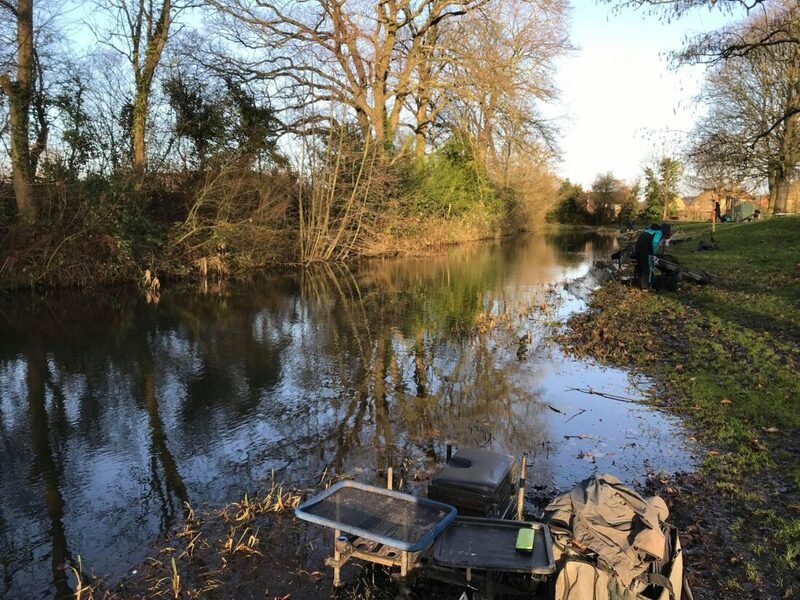 This magical mystery tour of a league continues and I have to say I’m really enjoying it, admittedly it’s been a bit of a roller coaster and quite hard work trying to find different places to fish but I always get a real buzz when the float goes under for the first time at a new venue. For this match Terry and me went to have a look at the River Parrett at Wick, another free stretch. We found half a dozen nice looking pegs at one location but not enough parking and then loads of parking but no pegs at the next section – what a nightmare! After loads more driving about, we had to admit defeat and decided to use Midelney and Muchelney although it also started raining hard so there was a chance we could end up on the pond. On our way back we stopped off at Ilminster Canal, one of my favourite venues, it looked really nice although gin clear. There were also strong winds forecast overnight and Sunday morning it was a tad windy! A few guys expressed concerns about the weather and when I got to the bowling club, we decided to give people the choice of either the river, the pond or the canal, with the latter winning hands down as it should offer us a bit of shelter from the wind. We had to do the draw when we got there in case of pleasure anglers but of course there weren’t any which didn’t surprise me given the forecast so we walked up through and pegged it. The far end peg was the one everybody wanted but Terry ‘The Toast’ pulled that one out the bucket, I ended up next door to him and was happy enough as there were a few reeds opposite. On my right I had Steve P who was my next peg neighbour for the fourth match on the trot! There was the odd small fish topping although I still expected it to be quite hard going and said I thought 4-5lb would be enough to win with 2-3lb framing. 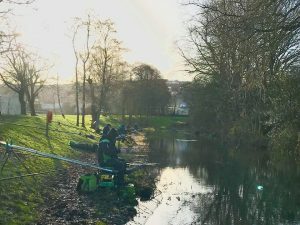 I set up a little Drennan Squatt float for fishing at 6 metres and a 0.4 gram rig to fish caster across to the reeds at 11 metres. Plumbing up, there was a lot of weed around and I was struggling to find a clear spot down the middle although it was better on the longer line. For bait I had chopped worm, casters and maggots. Nick Payne had his whistle with him so got us underway at 10:00, I cupped in a dollop of chopped worm and caster at 11 metres before starting down the middle with the lighter rig and single red maggot on the size 20 Gama Black hook. I was expecting to catch small fish quite quickly but the float just sat there, Steve went straight across, hooked a little roach and the rig went up the tree with the fish attached, luckily (for the fish, not Steve! ), it dropped off and he then lost the rig, not a great start! Dave P next to him got off to a better start when he landed a 1.5lb F1, which would be a handy bonus on a day like today. I was toss potting in a few maggots on the 6 metre line but after half an hour I hadn’t had an indication, nor had Terry or Steve although Dave had added a little roach. By all accounts, the guys down further hadn’t caught either and it was starting to look like being a rock hard match. I went across with the lighter rig just to see if I could get a bite but it was the same story there and I was starting to fear the worst when I went to move the rig and there was a fish on! I shipped back gently and netted a nice roach of around 3oz to get off the mark – phew! I then started getting some small perch between 1-3oz, with nearly every one coming just after the rig had settled or if I moved it slightly. Mark England turned up for a chat and as a junior he was a brilliant young angler, he then got into wildlife photography but said he’s just started getting back into fishing again, while he was with me, I had a really good spell with a bite every chuck, mostly small perch but I did have one nice 5-6oz roach. 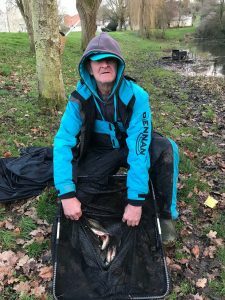 Terry was now getting the odd fish and Steve had lost one shipping back and also managed to get another rig stuck up the tree, not to be left behind, Adie down on peg 4 also did a bit of ‘squirrel fishing!’. One of the great things about this league is that despite the fishing being quite hard at times, it’s been a right laugh, which was handy as I looked up the canal to see Steve up the tree again and further down Adie’s pink elastic was at full stretch as he fought another losing battle with the far bank vegetation! With that, a particularly strong gust of wind caught my pole and I had to drop it on the water and when I lifted it up again my rig was attached to a very stubborn reed which I probably deserved for laughing at the squirrel hunters! I did get my rig back minus the hooklength so wasn’t out of action too long. I use the term ‘action’ loosely as, with two hours to go, I couldn’t get a bite! 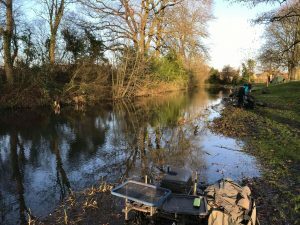 Adding the 13 metre section I searched further along the bank but had no indications at all, I still thought I was doing okay but knew it would only take a skimmer or F1 to overhaul my meagre catch of small fish. 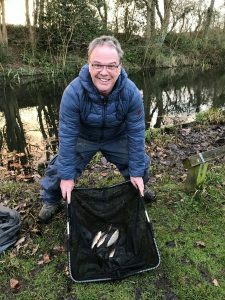 Dave was still catching quite a few small rudd and roach to go with his early bonus but then must have been feeling left out as he hooked an overhanging branch and lost the rig but went one better when he lost all his elastic too! It was now really cold and Terry shouted down that he wasn’t having much fun now! I jokingly replied that we still had the ‘golden last hour’ to go as the light started to fade! Dave set up another top kit and hooked a small fish, only for it to get tangled up with the remains of his previous rig and there was orange and yellow elastic everywhere! I was going through the motions a bit but then with 25 minutes to go, the float went under and I had another nice roach, then I lost one before catching a small roach and I started to think I might be on for a grandstand finish but they disappeared as quickly as they’d arrived and I went the last quarter of an hour biteless. My final tally was 21 fish which I thought might go two and a half pounds if they averaged 2oz apiece. 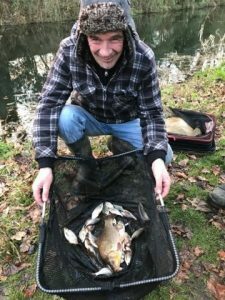 We packed up and started the weigh in with Terry who had a couple of roach and some small perch for 12oz, my fish then went 2lb 7oz (so not a bad guess! 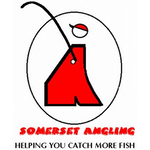 ), Steve had a level 1lb before Dave had 3lb 10oz which would win easily today. Adie had 6oz and then Fieldy had more fish than he was admitting to (no change there then!) and also weighed a pound, Nick chucked back his three roach and Ben didn’t weigh. I must admit I prefer the scales we used to use for these kind of matches as the new ones aren’t that accurate for low weight affairs. Terry had 12oz of mainly small fish! So Dave won, I finished second and had a nice pick up of £45 with the super pool and Steve and Fieldy tied for third spot. Graham also pulled a point on me in the league so going into the last match, there’s just one point in it. Adie has got a really handy set of loppers with a long handle so him and Dave went back to retrieve all the lost gear that was festooning the unseasonal Xmas trees! They managed to get everything too, although some of the floats were looking a little worse for wear! 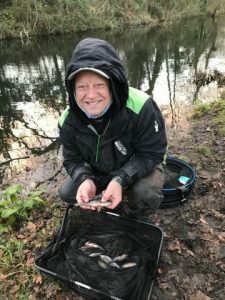 Adie said that despite only catching 6oz he quite enjoyed it and would like to fish it again and to be honest so would I, it would be good to fish it in more favourable, warmer conditions to see how it fished. Some nice roach and perch were caught (just not very many of them!). 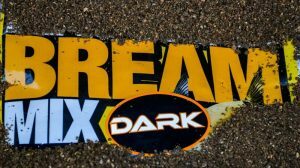 It does sadden me a little bit, I grew up fishing the canal and it used to be a fantastic wild venue that was overgrown in places but held a good head of fish, quality roach, rudd, perch and skimmers along with carp, tench, eels and a few surprises like golden orfe, crucian carp, gudgeon and even the odd chub. 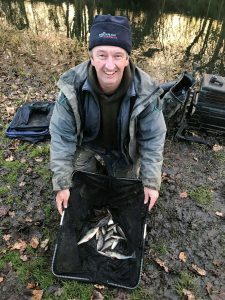 Weights were never huge in matches (usually between 6-10lb would win) but it was nice fishing catching quality silvers and pleasure fishing I’ve had nearly 30lb (20lb+ of quality roach, rudd and skimmers plus an 8lb carp). But now the bank is collapsing in places, there’s a lot of weed and sunken branches on the bottom and the trees could do with trimming back. 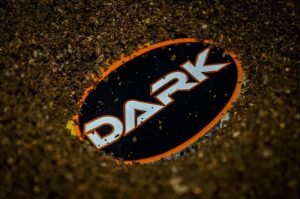 Also look out for this great new addition to the Pro Nat range from Bait-Tech, I can’t wait to try it out! NEW FOR 2019 The popular Pro Natural range has a new addition! 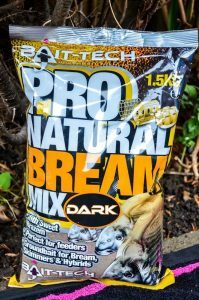 Pro Natural Bream Dark fills the gap where a fine super sweet mix is required in clear waters. This is a versatile mix that will bind well to carry lots of particles when targeting bream and other silver fish but breaks down quickly making it perfect for fishing on the pole or feeder on rivers, canals or lakes! OUT NOW! What’s happened to all those F1s that were put in Jamie ? I don’t know mate, that’s the first one I’ve ever seen caught down there! Hi Ken, thanks for your great feedback, I haven’t done much fishing down your way but I was talking to my nemesis (The Torquay Tart) the other day and I’m going to try and fish a few venues in that neck of the woods. 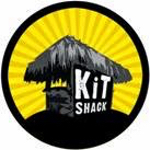 Where would you recommend mate? 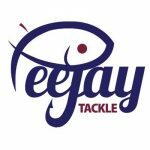 If going to Torquay area why not try Decoy Lakes near Paignton during the river close season and get some of those big tench. Friend used to target them at that time of year and the best was a few ounces short of a double. Feeder and rubber maggot fished tight to the snags. Thanks Chris, I like the sound of that!